In the summer, activity switches to the beach, and to the beach bars. Bally's Beach Bar offers an extensive drink menu that includes tropical drinks. The entertainment offerings are numerous, and include both live music and DJs. The Beach Bar offers food items from Bally's Pickle Deli. Bally's Beach Bar is directly across the Boardwalk from Bally,s Casino. It is open only during the warmer months. 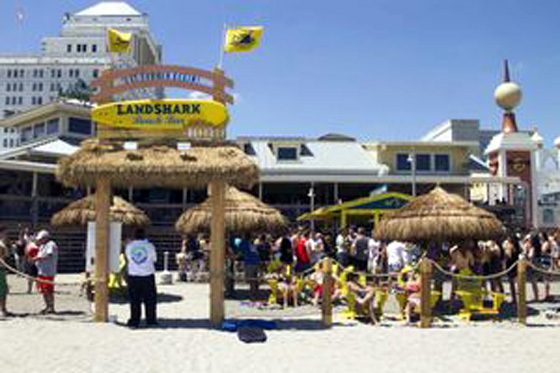 The new Resorts - Jimmy Buffett Margaritaville Landshark Bar and Grill is built on the footprint of the former Steeplechase Pier opened on May 24, 2013. It now has a beach bar. See below. The Deck is only open during the summer months.